Rich, crisp and spicy. Complex aroma and flavor: blackcurrant, dried blackberry, sandalwood, blood orange zest, lavender. Deeply pungent in structure. Long, resonant finish; a cocoa hint surfaces to complicate orangy citrus and lavender-like floral notes. 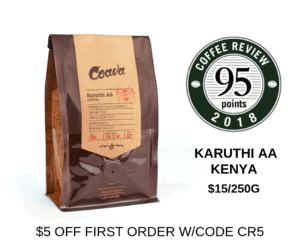 Produced from trees of the great and celebrated SL28 selection of Arabica and processed by the meticulous Kenya variation on the traditional wet or “washed” method, in which skin and fruit flesh are removed from the beans or seeds before they are dried. Plat Coffee is a specialty roaster and café in Hong Kong. For more information, visit https://www.courage18.com/. The Bottom Line: Superb and classic Kenya, intense in structure, layered and resonantly intricate in aroma and flavor.